This morning I took Eric Jansen and his son Evan from Dallas, TX. fishing. The morning started with a light breeze from the South East and clear skies and by 9 we had had been rained on slightly twice and up to 20 mph gusts from the North West. 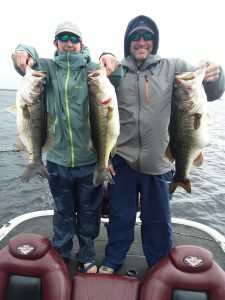 With all the change in the weather the fish still played along with both Evan and Eric landing fish over 5 lbs. and Eric’s weighing just under 7 lbs. I will have them again tomorrow and I am sure we will have a good time and catch fish although the temp. in the morning is supposed to be in the low 40’s. The fish are fat and full of eggs and they are eating like crazy. Give us a call to book your trip!